Forums - Mini-Torii/DM945's to be picked up early tomorrow! Mini-Torii/DM945's to be picked up early tomorrow! So, I'll be setting these up, finally, exactly 4 months today since we ordered it. I have the 'Esoteric Isotek Full System Enhancer Disc,' to accelerate the break-in period. I plan to follow Steve's suggestion on the [5 hrs on/5 hrs off] listening intervals, as part of this settling process. I don't know what to expect, frankly. It's all going to be new for me, including the compounded breaking-in experience on both the DM945's and the Mini, which may not be the most comfortable situation. I also need to properly blend my sub-woofer in that combo so as not to upset the sound balance. Lots of speaker positioning trial-and-error may be part of the deal, too. You are going to have a ton of fun and some good listening. Don't let the breakin scare you, you'll have some shifting sonic moments, but still be listening to excellent gear coming into its own. Congratulations! Re: Mini-Torii/DM945's to be picked up early tomorrow! Good luck! You're going to be too wrapped up exploring your music collection to pay too much attention to that. You're in for a real treat! I think you're probably right, now that I think about it. I may as well put the Esoteric Disc at night and 'play' during most of the day . BTW, I need to know asap if, when facing the amp, all the different switches are ON towards me or facing away from me? The amp came with all those switches facing away when looking to the front of the amp. Enjoy it and I know you will let us know how it progresses. Re: Mini-Torii/DM945's home at last! Wow! Every epitet I had read here, used to describe it, is for real. Although evidently not broken-in (there are evident traces of constipation in the higher registers), I'm impressed by the midrange transparency and the dynamic/vivid and musical lower registers. The bass has surprised me as it conveys a tightness that clearly discloses the different tones involved. I used to hear a mix of unclear bass tones before. Talking about bass, when I first plugged in my sub-woofer, a horrendous humming came through. Fortunately, the amp's volume was off. Puzzled, I then remembered a thread I read here about inverted pre-amp output phases. Hesitantly, I reversed these, and the humming almost dissapeared. Then, I used my sub-woofer's de-phaser and tried 180 de-phasing, much better. Finally, I lowered the set sub-woofer volume, and voilá, great (not unsettling) bass, without any humming. I'll be waiting for the higher registers to improve. As a matter of fact, initially these were quite bright and harsh. But after an hour and a half, or so, the brightness/harshness went gradually away. Now it just doesn't perform the higher registers as it would be expected from this amp, but there's no more harshness. It is simply a bit crude (somewhat undefined) and lacking incisiveness up there yet. I'm sure this is part of the compounded breaking-in (amp and speakers, power cord too). The output tube is a JJ 6V6 S, same brand as the rectifiers (EZ-81). The other tubes came in white boxes with only the spec number written outside. There may be something printed in the glass but I have not identified them yet. Volume wise, the max I kept it at was 1:00 o'clock (required to get the normal volume I need with some selections), in spite of the fact that presumably my DAC's output is max 2.25 Vs. I guess when you need to go that high, the source signal voltage gain is not that high. For most other music, the volume setting was enough at around 11:30 or so. Where are you, Fire? Lost in and loving your new setup, I imagine. Yes, I'm all over it! Amazing stuff. I hear you're getting your Triode Integrated anytime now? Let us know how it goes. Congrats! It's likely not the amp. I suspect what you are hearing may be due to the wider dispersion of the tweeter relative to the woofer, which is kind of unavoidable given the driver complement and flush mounting. Factor that polar behavior into your placement/toe-in/positioning and room decor/treatment decisions. You should be able to tame it. Does your MT have the treble control? As far as room conditioning, I have a floor carpet and drapers on the back and one side of my listening position. On the other side there is a naked wall so I may need something there. There are leather sofas in the room, so I suspect the only source of high-frequency reflection may come from that wall or the ceiling? Yet, the ceiling is quite far from the presumed high frequency dispersion path, again directed at my sweet spot. My M-T does have a tone control. Have not used it yet (I have it off). I don't think I want to cut higher frequencies, just focus them right. The sound is not harsh or too bright anymore, just not finished. Thanks for the tip, ski. I wonder if you are finding the limitations of your DAC? Are you able to adjust any of the upsampling filtering? My Wyred 4 Sound DAC1 alows me to play around with the filtering to change the sound's signature. My ZDAC-1 doesn't have that option, but it didn't need it. Also make sure that your Foobar is set up correctly, I messed around for a day getting my JRiver player correctly configured, there are so many ways to get off of track when you fall under the spell of computer audio. I have a decent sounding DAC. Although it could be improved, I feel It should not be the issue here. It works well in all other frequency ranges. What I find is a non-continuity of the marvels I hear at mid and early high frequencies when music goes to the really high registers, as if something was not working completely on that range. These differences are somewhat subtle, but I can hear them. Foobar and my laptop have been optimized/adjusted for months (waiting for the gear), and now I think I know almost any trick about them. Although the sourcing may still be the problem, I want to eliminate other possible causes before I decide I need to invest in a new DAC. Mine is an asynchronous USB/DAC, and does not offer upsampling alternatives, but I've found pre-converting the files to proper specs (into WAV) makes a lot of difference with the DAC: 44K1, & 96K, depending on the original recording and always using the 24-bit word size (from 16 to 24 is just ceros). I think it's possible you are hearing more high frequency energy than ever before because of the amp, speakers and cabling. I would play with that treble cut circuit. I find it a lifesaver myself. Things are still busy working in and breaking in. Took about a month in the case of my amps and speakers. Once broken in, I definitely had to use the treble circuit. My Torii and ERRs are so revealing I eventually went on a search for a great source. I thought I had a sufficient one but. . . well I was wrong. I hear you, Lon. Do you still use that tone filter with the new source? Reason I ask is to make sure that would solve this (relatively minor) problem for me before I decide on a new USB/DAC. I still think it's to early to tell. I think I'll wait for the break-in to be over and then re-assess the issue. In the meantime, I'm really enjoying everything else. Oh yes, I use the treble cut circuit. Helps with room interaction as well as electronic signal and recording differences. I do a bit of adjusting often. Steve's design is excellent, the control is not in the signal path, it just shunts the high frequency to ground bit by bit. I use them in both of my Toriis. I'm very sensitive to high frequency energy, and a lot of my digital recordings are messy. I really should be listening to analog. This circuit and the flexibility of my ERR tweeters are two reasons I love my Decware components. Got it. Well, it may be the case I need to start using it with some of my music. I just did not want to start curtailing what the system is capable of offering. Since the issue is not dramatic, I could still endure it during the break-in, even without the treble control, although I will be trying it later on. I'm sure my bottleneck, system-wise, is the USB/DAC and probably my speaker cables. Both are good but not at this level. Eventually, I'll need an upgrade, indeed. In the meantime, I'll work on the other variables. The sound of this amp and speakers is still amazing, though. Worth playing with during break in as well. What's the harm in curtailing some frequencies that are too much either due to break in, component quality, or room issues? Get the enjoyment you paid for! You can always turn the controls off once a day and do a "reality check." Absolutely, I meant I did not want to miss (if any) the improvements over time during the break-in, in this area. But certaily, I'll be using the control now and then. I wouldn't jump to the conclusion that your DAC or cables are causing the issue just yet. They may be at fault (I highly doubt it, but maybe). First address the more fundamental room/speaker part of the equasion before fixing something thay probably doesn't need fixing. An improved DAC and cables may make a difference, but orienting the speakers and treating the room to address the wide treble pattern the speakers throw will certainly make a difference. The author reports good results using a cross-fire type orientation. Perhaps give that a try. And Lon's right. Don't hesitate to adjust the treble knob, it won't adversely effect sonics. Like I stated earlier, I don't think those two are the culprits in this case. I was just stating that these are now my weakest links, relatively speaking, as now both speakers and amp are at the top. DAC & cables could be improved, but that is not the issue right now. So, I agree 100% with you. I'm just a little put off by the fact that the consensus seems to be this is not related to the break-in process. I'd have sweared that would have been the most likely cause of that incomplete or un-finished (not rolled-off) higher register. I would call it a little raw, unpolished. I firmly believe the system is improving gradually already. Room conditioning is something I need to address, indeed. I'll take a look at the link. Thanks, ski. I think this could very well be break in, but also the amp and speakers are giving you so much signal, so much detail, and some of it is less refined right now before tweeter and amp components are fully settled in. Definitely experiment with speaker placement, and consider room treatment, adjust the treble cut, and also try the system without the isolation transformers. I came to the conclusion that those I had were adding unwanted noise that showed up as a bit of raggidiness. Don't forget that YOU are breaking in during this process, too. But I think that a little toe-in, a little strategic diffusion/absorption at first reflection points, and a minor tweak of the treble control is just what the doctor ordered for that "raw, unpolished" high end. You'll hit the sweet spot as you experiment, and soon thereafter you'll forget all about your DAC, and what happened yesterday, and what's supposed to happen tomorrow as the music engages your emotions. Enjoy the ride! Checked the link. I had forgotten all about it, as I had read it long time ago. Their points concerning my issues are consistent with the re-positioning and room conditioning tasks I'm facing. Let me clarify that I love these speakers and the only caveat I'm noticing (as described) may well be something minor, the solution of which is probably well within my reach. So far, I have stuck with the equilateral triangle concept in my toeing-in approach. I guess I have all sorts of other angle possibilities open for trial and error, and I will probably find the best in my particular case. The only real constraint is the distance from the speakers' back wall. This is limited to some 18", albeit at an angle, which may equate to some additional distance. Problem solved! Believe it or not, this morning I placed the speakers straightforward facing, no toe-in, and the higher register issue disappeared. No more congestion, just plain wonderful sounds. It may have been incidental to the break-in curve stage, but in this position I really love these speakers. Contrary to what the Stereo Mojo review suggested (which seemed counter-intuitive to me anyway), it seems in my case there was some addition of high frequencies stemming from the toe-in placement. I guess those waves overlapped or something similar, at those angles. In any event, the dispersion now apparently has more room to propagate without any overlapping, and those high frequency notes become pristine when listening to really well recorded material. I can't explain the reasons, but this morning I listened for about 6 hours in a row with that placement and not once I felt the constipation issue again ... Now it seems as if the system is almost broken-in (which it's not, but to me it sounds delicious already). The only doubt I have is if I may be missing some sound patterns given the non directionality of the speakers to the sweetspot (as in the equilateral triangle principle), but I would be nick-picking here. So long as it sounds the way it does now, I'm happy, as I don't seem to be missing any details. The more I dwelve into audiodome, the more puzzled and surprised I become. Go figure! Great news FB. I've used speakers with no toe in for years, and also currently use my ERRs with the toe in extreme, that is the tweeters cross a few feet in front of my ears. There's no one way to do things, because we all live in different rooms with different furnishings, and we all perceive things a bit differently. Glad you are digging deeply!Worth the wait! Worth it indeed. It's the best audio decision I could've made, thanks to this forum's suggestions and support, and a wise choice from Steve. I'm enjoying it very much. It's still too early, but the progress from friday has been amazing. Now, I think I can finally put my arms around it in terms of my expectations from this gear, as I can hear its potential first hand. Re the overlapping of higher frequencies from the tweeters, IMHO either they are oriented to cancel each other (i.e., in front of the presumed sweetspot), or they are provided enough space to propagate without too much overlapping (forward facing placement, as in my case). From these alternatives, if the distance between both speakers is large enough, I would favor the latter. But, I may be totally wrong, as it could also depend on uneven reflecting surfaces nearby and so on. The point is, I'm having a ball with it. Have a nice listening yourself. Well and a further variable is that my speakers are very different than yours, though I believe they share the same tweeters. Glad the system is living up to your expectations. Really enjoying some SACDs right now. But time to watch two of my favorite television shows: The Killing, and Mad Men. Time to switch the Torii input and switch the DAC to the optical input via remote! Glad you're finally getting a handle on things, but you are far far from break-in. To be honest I can't even think about how bad it could get breaking in a complete system, or at the very least, in my opinion, the two main components in a system, amp/speakers, at the same time. I listen to brand new speakers all the time, but always on well seasoned gear. The tweeter does sound like your trying to force cookie dough out of it for the first 100-200 hours, the Mundorf cap seems real dark for the first 100 or so hours. Right from the get go, and even though the Mundorf's sound a bit dark, I think the realization for me, that there is no glare which seems to make top end to be more prominent and always wanting to attenuate the tweeter. Some pieces of music that I had previously thought were just poorly recorded, or that the mics had been overloaded during the recording process are as smooth as silk. Now onto your room....When I built my room, and it was pretty much purpose built for audio, yet at the same time, I've aways had a desk in the right rear corner. At first it was just a typical desk, then transforming into an armoire desk with a flip down writing surface. A few weeks ago the wife and I did some room re-arranging and out went the Armoire, which means my room is totally audio. Back in February, Chris K from the forum had come down for a few days and he thought that my room was one of the best imaging rooms he had ever been in. This weekend, I flip flopped the room and everything from imaging to bass response has gotten so much better, its just like a changed my whole system. The side walls haven't changed, as it has Decware diffusers down both walls. The only thing that has really changed is that the live end of the room (no treatment what so ever) is now behind the speakers and the rear wall is diffused and bass trapped. Has me wondering why I didn't try this 4-1/2 years ago? So give the whole system a good chance to break in, then start adding other components until you are in audio bliss! I wouldn't worry about what other people say is the best way to set up a set of speakers. Like Lon said we all live in different rooms with different gear. What ever you like, is the best way to set up your system, period!!! I sometimes have to laugh at reviews, they show this list of some of the most expensive gear that they used for the review, then show a picture of the set up, which could probably be the worst sounding room in existence, and they are reviewing a piece of audio gear. Then I read where one speaker manufacturer wont allow anyone to review his speakers, unless they go to his place to review them. He also won't show his speakers at audio fest and the like because he knows how bad some of these rooms can sound. At the same time, he can diss a simular pair of speakers that he heard at one of these fests, without the disclaimer that the room could have had something to do with wat he had heard. Then argue it to the n'th degree. Well enough ranting from me. Back to getting Steve's beautiful SE34-I amps bases There is something about the dimensions and the gauges on this amp that are just so right...Hard to explain, its just right! *I* would not change cables, the DAC etc. until there are plenty of hours on your new components. Resist the urge. Thanks for the inputs. I can't even imagine how this gear is going to sound after break-in, as right now I'm simply so impressed with it, with only three days using it. If the result of breaking-in is a tangible improvement over the current state, it is going to be something beyond all my original expectations. I'm glad you brought out break-in as a definitive variable in the possible issues with my upper registers, although, as I reported, now I feel very comfortable with the overall sound, partly due to initial break-in progress and partly due to the speakers' new placement. Like I described earlier, I only have one side wall without reflection blockage. This wall, though, is at double the distance from the speaker than on the other side (which has drapers). This is probably why I can have the speakers facing straight ahead without apparent audible issues. Your earlier advice on tilting-up the speakers was also right on the money, as these are resting in Teak ramps taylor made to the same footprint of the speakers and featuring a 1 inch height difference front to back (on an 18" high furniture table). The direction of the linear sound waves hit my ear level as I seat on the sweetspot. 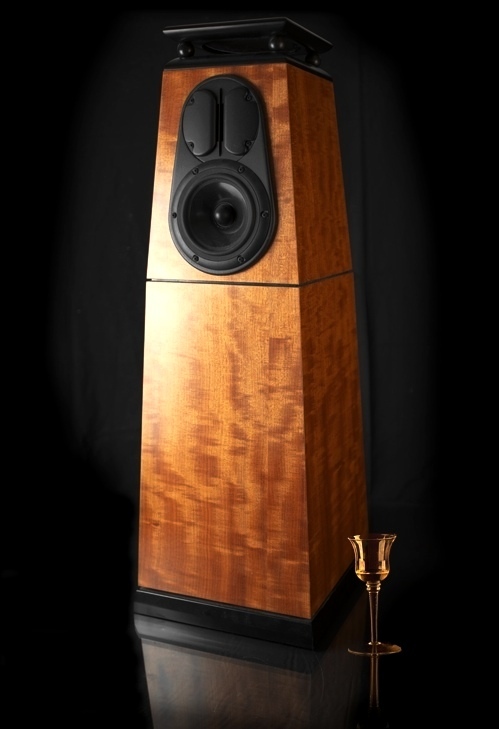 Let me congratulate you on the finish and esthetics of the speakers also. These are simply great. Of course, the Mini-Torii looks so nice between them, like a jeweled crown. Voices are coming out very natural and conveying physical presence. Every tongue movement, whisper, breath passage on the singer (in close mic audiophile recordings) can be heard quite distinctly. So are the squeaking sounds of fingers rubbing the cords on a guitar. Just amazing! I listen to plenty of classical music also, and until now the mix of many instruments at the same time was just typically a mess. This for me is the most critical task demanded from a speaker-amp system, along with the bass line. Although not perfect yet, the difference in those passages is amazing. I'm betting a mature break-in process will improve this aspect further. I'm setting the cross-over on my active sub woofer at about 65 Hz, at relatively moderate volume levels, and the blending of this with the bass from the speakers is flawless. I suspect the M-T preamp driving that sub-woofer is definitely responsible. I will eventually test several other cross-over points to check where the best combination lies. These speakers have plenty of bass, just missing on the very low registers, naturally. I apologize for the length of this message. I thank you for your terrific support from the get go. Keep up the excellent work! Seriously, you are going to be a happy camper with this amp. Whatever the waiting period, is worth it. The point is that making 'changes' will be chasing your tail until the new stuff is settled in. *I* just try to not listen critically until then. I doesn't work...but I still try. I'll just be patient and wait for mine. I am in no hurry and by the time I get it my speakers should be fully burned in. I confess that I have picked up quite a few tubes though and they were not expensive. I do suggest that you get a pair of Mullard or Amperex EZ81's and be happy for a long time. You can find Mullards relabeled RCA on fleabay. They sell for less but are still Mullards. I can tell you are stoked! Interesting tube suggestion. I thought I would eventually try some output tubes to vary the amp's signature a bit, but had not thought of rolling rectifying tubes. I keep thinking about the Valvo 350B as an alternative to my 6V6 S's. Why would you start with the rectifiers? BTW, the stock tube set on the Mini-Tori includes OA3, OC2, 6N1P-Ev, 'JJ' EZ81 and 'JJ' 6V6 S. The 6N1P-Ev replacing the original 12aU7 for some reason. It could well be the gain issue. I've gone beyond the middle of the volume dial (to a max of around 1:00 o'clock) without any distortion in spite of my 2.25 V DAC output. So, I suspect the new driver choice may have to do with taming the sensitive gain? Anyway, like you said, it's too early to think about rolling tubes. Now I'm more interested in conditioning my listening room somewhat and optimize the speakers' placement. The rectifier is the lifeblood of the input stage. Finding the right "symbiotic" relationship between the input tubes and the rectifier tube goes a long way towards getting the entire "picture" right. I love the 6N1P tube. Over the years I've tried a lot of other tube types in my Decware amps. . . but that one is the one that sticks. Yes, the 6N1P is a very fine tube IMHO, well worth a try. Well, I'm happy I got that one in the stock tube compliment. But for tube rolling (eventually), wouldn't you say the output tube should be the first to try out? They're all going to make a difference. I find that for my purposes and with my intention to make the bulk of my collection sound good (rather than make my best recordings sound fantastic) I settle upon an input and rectifier combo, then find the right output tubes, and then experiment with voltage regulation tubes. Roll the rectifier. The JJ EZ81 is prone to failure. Google Jim McShane..he has fully tested RFT EZ 81's. *I* don't know what works best in the Mini but I have Mullard, Amperex and Tungsram EZ 81's acquired a long time ago. I did get a pair of Valve Art 350B's about $50 shipped. Kevin prefers the 6BG6 but you need an adapter. Remember, his unit was used and already burned in...See first paragraph...IMHO start there. I see, hmmm ... aside from the fact that JJ's are geting a bad rap (justifiably so), and that it makes sense to have an extra pair of reputable brand rectifiers, I think Steve has chosen this particular tube compliment as a set he finds sounds great. I definitely cannot go through a trial-and-error frenzy without any tube rolling experience, so I agree on getting those rectifiers pronto, but would hesitate to change input tubes, for example. I'm assuming changing the rectifier brand will still meet Steve's criteria for the whole set, so I see no point in replacing input tubes together with the rectifiers. I understand the reasons in your case, Lon. I just don't have your experience to be aware of what I'm looking for, to start with. When it comes to output tubes, though, it seems easier. Having a good compliment set backing those, you are only testing for output tube sound differences. Any internet sites of your preference to get those rectifiers and possibly output tubes? Thanks guys. I was unaware that the 6N1P tube is being used in the inputs. When did this happen. I don't know when it changed, as I was wondering why they were using the EZ81 rectifier tube where my amp uses the 6X4 or EZ90 rectifier, then I see they are rolling 6 volt tubes, where my amp uses the 12 volt tubes. RR did you ever try the 12AV7 tubes in your Mini-T, they are a little to much for mine, which is a shame, they sound so good everywhere I can use them!!! The 12AV7 tubes were too bright in my TABOO, so I did not try them in the MINI. The MINI product page does not reflect the changes to the 6N1P and EZ81. The EZ81 replacement has been in the Mini's manual for some time. The 6N1P-Ev was a surprise to me. I did e-mail Steve about that over a month ago. Either way the Mini-T is a great sounding amp, I've yet to try it with the Trapeziums, have you tried that combo RR? Sorry I have not, but just might. With a Big Torii and an SE34I.3 coming in to the stable the MINI might wind up at the office with the TRAPEZIUMS. The MINI was intended as an office amp, come to think of it. The JJ EZ81 just has poor QC from the factory. There is no way that Decware can supply the tubes we will ultimately prefer. Different output tubes can place greater demand on the rectifier and that is what can make the JJ's fail. That has been my point all along, when discussing pros and cons of extreme output tube rolling in another thread. Regarding Steve's choices, I prefer using his stock great sounding 'middle of the road' approach tube compliment until I learn more about the different tubes' sound interactions and characteristics. I trust his ears. Frankly, I think the most vulnerable area in the M-T is the rectifying circuit. It caused failure of the original 6 x 4's and it may be now creating failure on the EZ81 replacements. I think the demands of a true rolling platform design has to have a tradeoff somewhere and it may be that rectifying circuit. Isolated JJ case or not, this is where one needs to be protected, like you suggested previously, with a reputable (tough) rectifier brand. I just think Steve's stock tube compliment set reflects his experience in the tubes' specs and interactions. The quality control issue in the JJ EZ81 is out of anybody's control. BTW, I found McShane's prices in general a little bit on the high side.